I know it might seem like I dropped off the face of the earth, but I assure you, I'm still here, despite a very scary health scare less than six weeks ago. As many of you know, I have leukemia, which I've been fighting since August and for which I will have completed eight months of treatment in just a couple of days. Not long after my last post, I started to get very sick. I started having very serious pain in my right side that wouldn't go away, a lot of digestive issues, nausea, vomiting, and was just not feeling well. It was probably the sickest I've ever felt. Most of the pain was in my right side. Naturally, we started thinking it might be appendicitis and on Monday, March 17, I was taken to the ER. For the next two and a half weeks, I remained on bed rest. During that time, the lease on my car was up and because I'd been so sick and unable to work over the past few months, I had no way of getting in a new one or even going month to month. I had to leave my coaching job behind and a lot went up in the air or out the window very, very quickly. Less than a month later, I tripped going down the stairs and dislocated my shoulder. I also bruised my tailbone, my femur, and had severe contusions to several ribs. The good news is that I'm doing a lot better. I still have the UTI that is determined to stick around and I'm adjusting to life without a gallbladder which has proven to be a lot more difficult for me than it was for my mom (who had hers out about two years ago). I'm still in some pain, but I'm mostly okay. I also decided during that time that I needed to find a way to get financially solvent again. For that reason, I decided to get back into my Mary Kay business and it has been SPECTACULAR for me. I've promoted myself to the top 6% of Mary Kay in under 20 days and am so close to going on target to earn my free car. 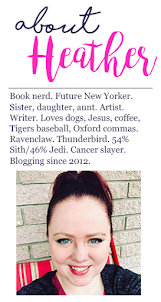 I've always loved my Mary Kay, but this time, fueled by an absolute need to find something that would not only provide for me but allow me to continue doing things I love -- like blogging and reading. Now that I'm on the mend and making money, I've finally got some time to focus on blogging daily. I've done a lot of reading and have lots of back reviews to post! And I'm getting ready for my yearly NYC trip. This time, I'll be there for 16 days, with three of those being BEA (Book Expo America) and the BEA Blogger's Con. I'm SO excited for the future and for this blog. My traffic was still so high these past six weeks, even though I wasn't able to do any posting -- thank you, all of you, for continuing to come here, read, and check in on me! I'm so sorry to hear about your health scare. That sounds terrifying! I'm glad you're feeling better though. Hope you have a great time at BEA and in NYC! Heather I had my gallbladder taken out at 18, I had signs and symptoms for two years and my mom acquired the same signs and symptoms, she had hers taken out then in 09 just half way through my first college semester I kept getting sick and it got to a point where I had so much pain that we called my doctor and he sent me to the hospital knowing that it had to be gallstones. It was gallstones but then the doctor who took my gallbladder out said that because I've had clear signs of gallbladder issues that he recommend it. Surgery is always consider invasive for me because I'm on a blood thinner and my blood counts goes completely wonky after some sort of surgery. Yes it was tough to move around after the gallbladder surgery but I recovered in about two week and spent all hours catching up on school work since I was sick and it was midterms. Hope you feel better soon!